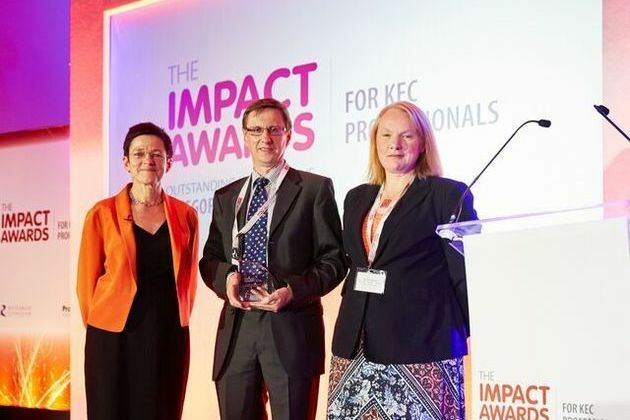 The Centre for Global Eco-Innovation has won an Impact Award for knowledge exchange and commercialisation (KEC) professionals, delivered by Research Councils UK (RCUK) and PraxisUnico. The winners were announced at a ceremony in Central Hall, Westminster. The award reflects the success of a unique partnership between Lancaster University, the University of Liverpool and international commercialisation consultancy Inventya, who have delivered the £9.8m Centre for Global Eco-Innovation since 2012. The centre works with businesses on innovative environmental research and development projects and is funded by the European Regional Development Fund, the Universities and privately by Inventya. Over the past three years, the Centre for Global Eco-Innovation has assisted 290 SMEs, supporting the companies to develop and take their products to market. The majority of the companies were directly assisted by Inventya and received mentoring in the development of their products, market intelligence and funding strategies. Inventya also referred companies to the two universities, who provided interns and 50 graduate researchers, which provided in depth support to the SMEs. The Centre for Global Eco-Innovation is the only centre of its kind in Europe and is an SME-led collaborative research and development partnership, which underpins the development of new products, processes and services for the global marketplace, which by virtue of their use, manufacture, raw materials, reuse or disposal, deliver positive environmental impacts. For further details about the Centre for Global Eco-Innovation and working with Inventya, please contact Dr Martin Andrews, Project Manager: m.andrews@inventya.com.